If you ended up here, I’m sure it means that you have been desperately looked for something that could help with the chronic pain caused by fibromyalgia or other related conditions. 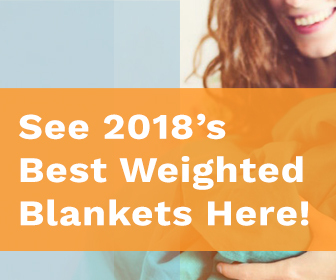 You’ve probably come across an article here or there that spoke about many different ways of combating the symptoms, and let me tell you about one that not many people know: weighted blankets. Yep, these trendy weighted therapy items that have been often related to alleviating insomnia and anxiety can actually ease off chronic pain, the main symptom of this condition, most importantly providing a bit of relief to the widespread pain. So, I’m going to dig into this topic for you today, and help you understand how is that. 2 What about chronic pain? 3 How can weighted blankets help with Fibromyalgia and Chronic Pain? Fibromyalgia is classified as a chronic condition of pain mainly affecting the muscle tissue, ligaments and tendons. Receptors in the central nervous system are in overdrive, causing unusual and long-lasting pain. This can cause discomfort, pain and tenderness throughout certain points or all over the body as well as a heightened sensitivity or pain response to pressure applied to the affected points. For some people, it is a feeling that runs from their head to their toes and can be completely debilitating depending on the severity. Strangely enough, FM is way more common in women than in men, and not only affects people physically, but psychologically and socially too. It is said that there is no cure for fibromyalgia, and that this condition can only be managed through certain treatments which we’ll look at in a moment. You can have great days and very bad days in terms of pain, which makes tending to daily life and its activities very difficult. Do take note that stress can severely influence these symptoms, making them much worse. I’m sure you are wondering how that is possible. Well, it’s because when the body is in a state of stress there is an increase in the hormone cortisol. When there’s an excess of cortisol in the bloodstream it prevents the body from healing and regenerating as it normally would, increasing the acuteness of the symptoms. The precise cause of fibromyalgia is still unknown, but it is thought to be due to inflammation of the tissues in the body. However, it is not the same type of inflammation that causes arthritis. Chemical imbalance in the body or low levels of serotonin, noradrenaline, and dopamine in the brain. Much like Fibromyalgia, chronic pain is also a permanent condition that affects parts of, or the entire body. It is defined as chronic when pain lasts for more than 3 months. This pain can be anything from a dull ache, throbbing, stiff and burning sensation to a sharp shooting pain. Sometimes the cause of chronic pain is hard to distinguish if none of the above conditions were apparent. But note that signs of nerve damage can be tingling in a limb, hands or feet, or experiencing a sensation of pins and needles when stretching, or doing regular activity. Both chronic pain and fibromyalgia can affect your health in various ways and cause underlying responses such as extreme fatigue, sleeplessness, mood swings, irritability, forgetfulness, headaches, dizziness and loss of appetite. Both these conditions can influence the desire to move or do any physical activities, resulting in weakening of the body, muscle fibers as well as stiff and swollen joints. Loss of flexibility and stamina is also a result. This is a double-edged sword as that decrease in mobility will increase pain as the body becomes weaker. Which can also result in depression and anxiety. Thankfully, there are some options to manage these symptoms and we’ll get into that now. How can weighted blankets help with Fibromyalgia and Chronic Pain? If you’ve read some of our articles, you may know by now that using a weighted blanket provides a sense of protection, safety and security and eases anxiety and stress among other things. It does so by touching certain pressure points in the body that helps release the feel-good hormones, someone with fibromyalgia and chronic pain are lacking, like serotonin, noradrenaline and dopamine I mentioned before. Using a weighted blanket helps your body manage and calm those sensory overloads that can cause pain and tension, making it a great everyday treatment that won’t break the bank and, thankfully, has no real side effects either. I will add that a heavy blanket applied over the body helps to calm down a hyperactive or hypersensitized nervous system, aiding the body to relax the nerve endings and relieve pain. As the body learns to calm down and relax on a regular basis, healing can take place more effectively as you start resting better and having less discomfort. It might sound too good to be true, but it is really simple science based on pressure touch therapy and overall well-being and relaxation. It’s clear that the benefits of using a heavy blanket far outweigh what I’ve mentioned here, as it also helps decrease other sub-symptoms that are caused by a life with pain. Both chronic pain and fibromyalgia can be treated through conservative means such as medications to relieve pain, relax muscles and improve moods as well as cognitive behavioral therapies and so on may be prescribed. However, daily self-care is the most significant as this will influence your lifestyle and most importantly your quality of life. There is a variety of ways you can use and benefit from weighted blankets at home and in the workplace as a treatment for pain and fibromyalgia. Lying under a heavy blanket while you sleep or even whilst relaxing on the couch is one way to self-treat. But using a weighted lap pad while sitting in the office, or a heavy shoulder pad when working at the computer, will reduce pain and improve your ability to function throughout the day without getting too fatigued, immensely. Regular hands-on massage therapy and acupuncture treatments will also work wonders for someone with FM or chronic pain and I can certainly testify to that from personal experience. Light exercise, stress reduction and relaxation, chiropractic therapies, stretching, swimming and other water therapies will also aid in managing pain symptoms and its severity. Ultimately leading a healthy lifestyle will be your key to success. Avoiding unhealthy habits such as smoking, drinking, poor diet, and lack of exercise will help improve these conditions too. However, combining this list of treatments and lifestyle enhancements with the use of your heavy blanket will boost the benefits and pain-relieving effects for the long run. Allowing you to get on with living your life to the fullest.